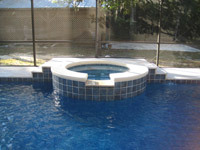 Having a new pool built was a little overwhelming but you and your staff at Family Pool, Spa & Billiard Centers helped us through the process and made this experience one that we would do again. We appreciated that you had us swimming in our new pool quickly and finished the pool within the time frame you had estimated. Our pool is exactly or better yet, better than we had envisioned and we thank you for being there to help us overcome any issues. All your subcontractors delivered as promised and were very helpful answering our questions.